Richard Sedlmayer was a civilian engineer who resided in München. He was mobilized at a Leutnant der Reserve in the 1. Reservekompagnie of the 1st Bavarian Pionier Battalion. The Bavarian Pionier Regiment was disbanded in January 1917, the 1. and 2. Bataillon as well as the 3 Kompagnies of the Pionier Belagerungs Train were renumbered as independent Battalions. Sedlmayer served bravely throughout the war fighting on the Aisne, on the Somme, in the Artois and in Flanders. He ended the war on the staff in the 17th Bavarian Pionier Battalion. His introduction to the war took place at Orchies, a town in the Nord-Pas-de-Calais region. Postwar authors have described the punitive action as the French equivalent of the destruction of Louvain. French reports claim the medical personnel were fired on as they advanced in a vehicle devoid of Red Crosses, the mutilation of the bodies caused by Artillery fire and not by villagers. The destruction of Orchies in not mentioned in the Battle Calendar of the 1st Battalion. Most of the companies cover the period from the 23rd of September as the “Battle on the Somme”. The 1. Reserve Company has the whole week left blank. ...As the next action of the Battalion was declared a “War Crime” we feel it fitting to show an account of the action as recorded in the Battalion history. On the 24th of September 1914 a train was stopped in Valenciennes and on the orders of the Ettapenkommandant the I. bay. Pionier Bataillon debarked. According to the Kommandant, French troops were advancing towards Valenciennes from the town of Orchies and he needed troops to guard the three bridges over the Escaut Canal. The responsible A.O.K. confirmed that the Batallion should act on these orders. 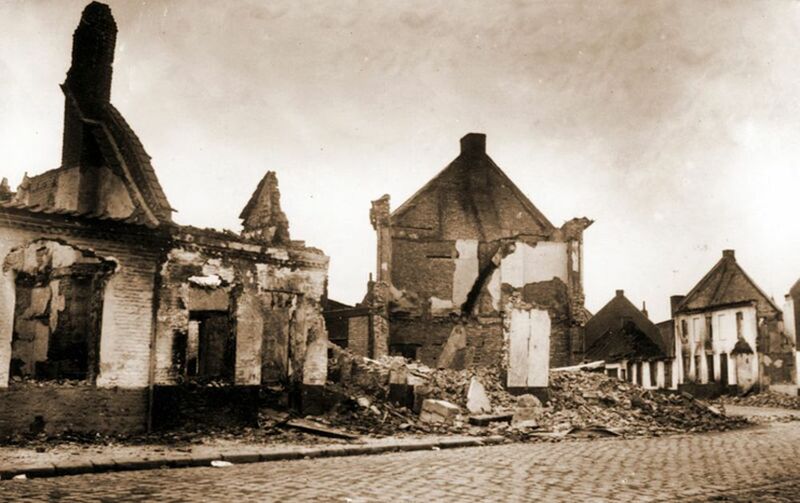 At 8:25am on the 25th of September the battalion received verbal orders from the Ettapenkommandant that the town of Orchies was to be razed to the ground. It was believed that German medical personnel had come under fire from the village on the 23rd of September. The battalion was also to look for about 30 soldiers missing in action from the Landwehr Infanterie Regiment 35. The Battalion began its march to Orchies at 09:15. During the march orders arrived from the Ettapenkommandant that if the Battalion can under fire they should not advance but should occupy trenches on the western edge of St. Amand. At 12:15 the Battalion reached the Western edge of St. Amand. During a March break a bicycle patrol was sent out to determine if French troops were approaching from Orchies or if the village was occupied by enemy troops. At 12:45 the march continued as there was no evidence of enemy presence. Exiting the village a windmill at Petit Prillon was observed. It had not been turning, but as we marched into the open it began to move. Efforts to keep the sails turning seemed suspicious and a patrol arrested the two men operating the windmill and to prevent possible signaling they burned it to the ground. Approaching the village part of the bicycle patrol arrived and reported the village was empty with the exception of a number of older citizens. The Patrol brought with them four civilian prisoners, two of which had been caught standing over the body of a soldier from the 35th. There was no evidence that they had plundered or interfered with the body and no reason to doubt that they were simply looking out of curiosity. For this reason they were not executed. The prisoners were delivered to the Ettapenkommandant. The conditions of the bodies found were later recorded in a medical report. Approaching the village the 1. Res. Komp. turned to the left and advanced to secure the Southern border of the town, advancing to the western exit to stop the local population from fleeing. The 2. Komp turned right and did the same on the northern edge. The 1. Komp marched directly into the village. The Houses were all boarded up, only 20 or so older or sick men and women were found. During the search of the village ammunition was found in some of the houses, in the Council building a few rifles and a sword. One badly wounded soldier of the 35th was found as were 8 identity tags in the Mayor’s office. 21 bodies were found in the surrounding fields with injuries that defy description. The villagers, including the sick were assembled at the south east exit to the village, the wounded man taken to the hospital by wheel barrow. The village was then torched. Two houses which had been marked as medical aid stations, including the one where the man from the 35th had been treated were spared. The old and sick villagers were left behind and the (now) nine prisoners and two millers were taken with us. Also taken were 2 priests, one from Flines les Raches and one from Lille. The dead of the 35th were buried with military honors in three graves. Its punitive expedition finished, the Battalion left the town at 7:30pm and headed for Valenciennes, with them were any men from the village deemed fit to bare arms. They were to be deported to Germany. It should be noted from the description of the events above that the battalion acted with remarkable restraint considering the evidence of mutilated comrades and the orders they had been given. It is probable that the bulk of the villagers had left before our arrival as they knew that they deserved a harsh German retribution. The next day the battalion continued its journey to St Quentin. French records report 5 civilians killed on the 25th of September including two 75 year old infirm inhabitants who could not leave their house and the 21 year old Germaine Piquet who was shot while trying to rescue her cows from the flames. Leutnant d. Res. 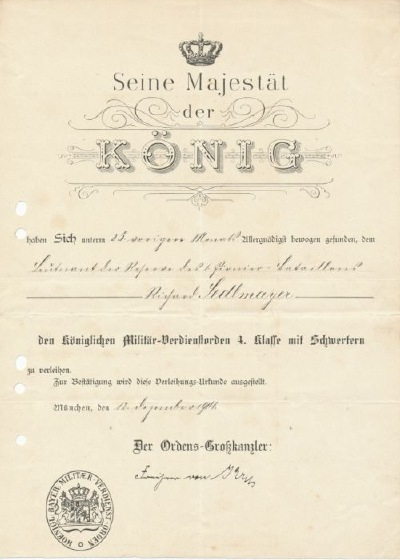 Sedlmayer was awarded the Bavarian Military Service Order 4th Class with swords on the 12th of December 1914. At the time of the award his company was preparing positions between Lihons and Andechy. At the time of the award Leutnant der Reserve Richard Sedlmayer was 1st Reserve Company. The award was made on the 24st of October 1914 by General von Fasbender, commander of the 1st Bavarian Reserve Korps. At the time of the award the company was in Combles on the Somme. The “Race for the Sea” was over and the Allied and German armies were digging in, preparing defensive positions that stretched from the Channel to the Swiss border. 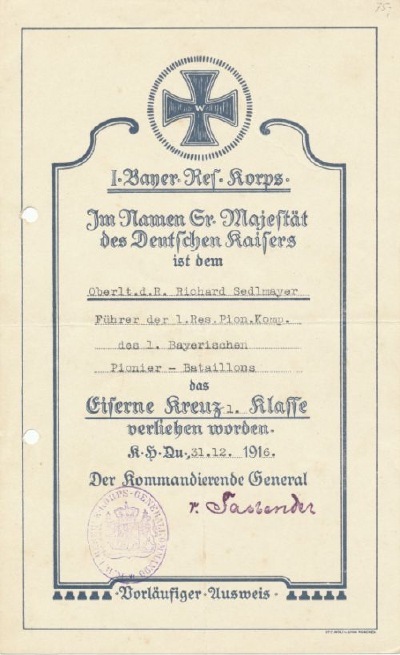 At the time of the award Oberleutnant der Reserve Richard Sedlmayer was in temporary command of the 1st Reserve Company hence the title “Führer”. 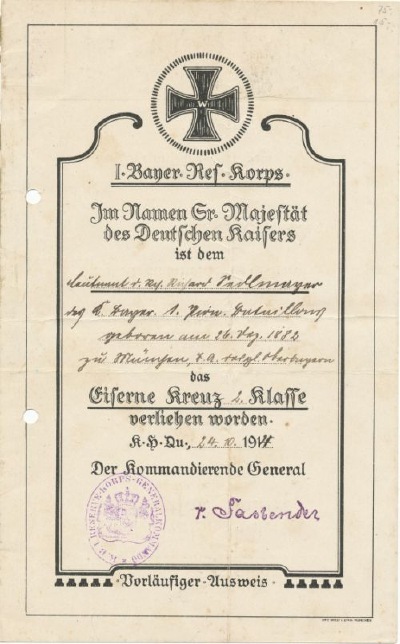 The award was made on the 31st of December 1916 by General von Fasbender, commander of the 1st Bavarian Reserve Korps. This document has a light bluish tinge to the ink. At the end of 1916 the 1. 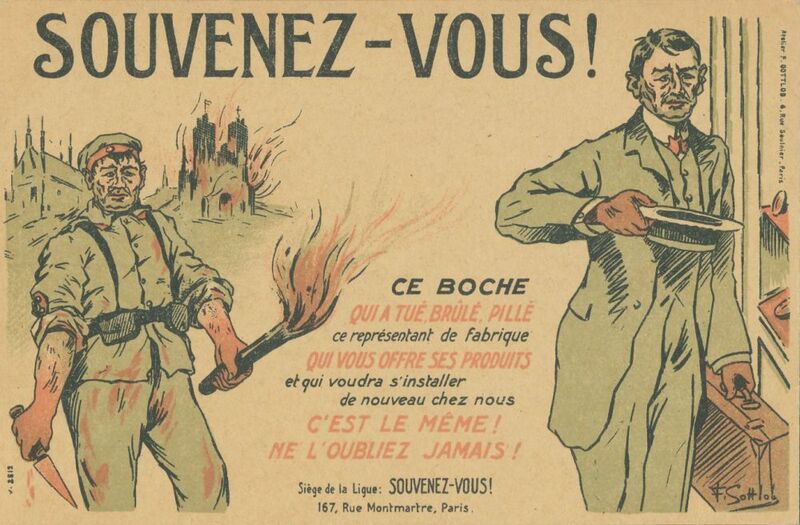 Reservekompagnie was engaged in mining and counter mining under the front lines near Lens in the Artois.